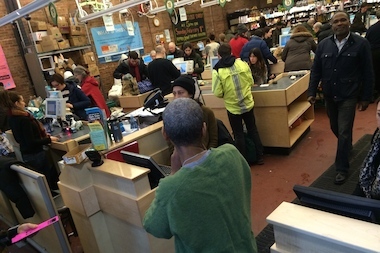 Members of the Park Slope Food Co-op voted down a proposal to form a committee to oversee the store's employee pension fund. PARK SLOPE — Park Slope Food Co-op members rejected a proposal Tuesday to put a committee in charge of its employee pension fund, which was until recently invested in a handful of volatile biotech stocks chosen by one person. Co-op members voted 472 to 152 against a plan to put the troubled pension fund into the hands of a committee that would oversee its investment moves, the Food Co-op announced on Twitter. Members floated the idea of forming the committee after the pension fund's up-and-down performance came to light earlier this year. The pension, a benefit that's available to the co-op's paid employees, lost almost 20 percent of its value in one recent year and was underfunded by $3.1 million, according to the Wall Street Journal, which first reported on the pension problems. A co-op member had been overseeing the pension fund's investments and stepped down after the problems surfaced. Another co-op member then took control of the fund. But some co-op members thought decisions about the pension fund would be better handled by a group rather than one person. They proposed forming a pension fund oversight committee and their idea was put to a vote at Tuesday night's co-op meeting. The members who wanted the oversight committee were worried the pension fund's losses could eventually affect the co-op's core mission of providing cheap food to member shoppers, because the co-op could be forced to dip into its operating budget to plug pension fund shortfalls, co-op member Eric McClure said in an interview. McClure was part of the small group of co-op members who proposed creating the oversight committee. He said Tuesday's vote was a disappointment. "The intent [of forming the committee] was to shore up the pension fund and to make sure there were some other eyes on it so the risky investments that were made in the past aren’t made again," McClure said. The Food Co-op's general coordinators did not respond immediately to a request for comment. General Coordinator Joe Holtz defended the pension fund's stock picks to the Journal, saying that they were well-researched. The pension fund altered its investment strategy after the performance problems were revealed, and now appears to be on a steadier path, McClure said. The Park Slope Food Co-op was formed in 1973. Members must work at the store for two hours and 45 minutes a month to earn the privilege of shopping at the grocery, which sells mostly organics goods at a discount.